Is it possible that Russia could replace the U.S. Dollar with Bitcoin? According to a high-profile Russian economist, this could happen in the coming months. If true, Bitcoin might see a resurgence into a new bull market. This would come as a direct result of new U.S. sanctions which force the country into diversifying. Due to the impact of U.S. sanctions, it makes sense that Russia would look to mitigate the damage through Bitcoin. The country has been forced to dump US dollars and US assets. As a result, it is looking to invest what could be billions of dollars into the cryptocurrency. Russia is convinced that the inability to use the dollar will drive other countries to pursue other alternatives as well. Russia has made it know that it’s not against cryptocurrencies, but rather that digital currencies to carry inherent risks. Still, there are many within the country that believe Russia will begin to diversify its reserves with Bitcoin as early as February. 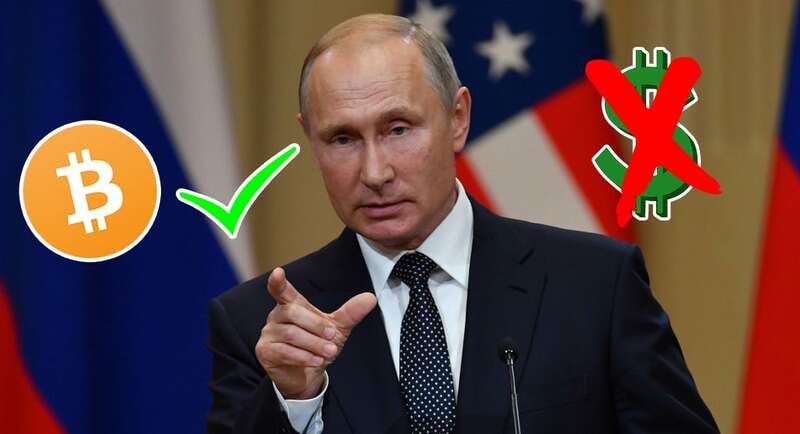 Unlike other world leaders, Mr. Putin has never explicitly condemned Bitcoin or cryptocurrencies in general. He has noted serious risks with the industry but has also mentioned that there are advantages as well to the new technology. Russian authorities have long discussed the potential removal of the dollar from the country’s international trade. Mr. Putin is convinced that the country will eventually be able to move completely away from the U.S. dollar. While progress has been slow, the country has made several transactions without the dollar. Russia’s potential investment in Bitcoin may come as a direct result of various media outlets begging for the country to adopt Bitcoin as an asset haven. If the country does decide to invest in Bitcoin, it could result in a massive upward surge in the currency. A similar situation happened in 2018 when many wealthy Chinese residents moved their money into Bitcoin. In the meantime, Russia has been stockpiling non-digital gold. Several outlets report that the country is exchanging U.S. debt for gold. The country has more than tripled its gold reserves as it prepares for potential new sanctions from the United States. Russia has been hit with sanctions several times by the U.S. and the EU due to its intervention in other countries. But Russia isn’t content with merely diversifying its assets. The country is also pursuing a closer economic relationship with China in an effort to establish a new payment system. This system would be independent of the U.S. dollar. The countries have discussed the use of yuan the ruble in their bilateral trade.